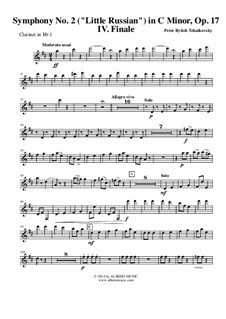 Transposed Part for Clarinet in Bb 1. 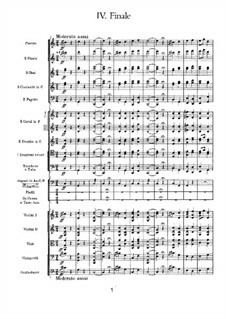 Originally for 1st Clarinet in C.
Tchaikovsky Symphony No. 2 (Little Russian) in C Minor Op. 17, Movement IV. Finale- Moderato assai. Rehearsal letters and measure numbers may or may not coordinate with other scores. 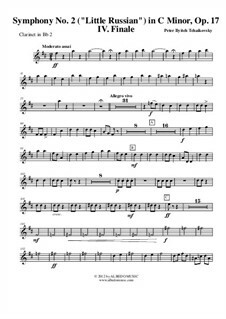 Transposed Part for Clarinet in Bb 2. 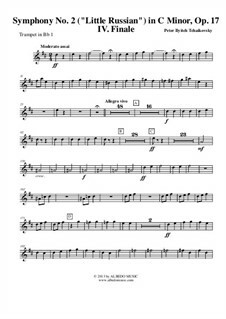 Originally for 2nd Clarinet in C.
Transposed Part for Trumpet in Bb 1. 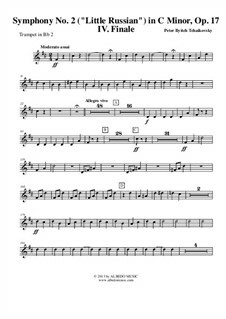 Originally for 1st Trumpet in C.
Transposed Part for Trumpet in Bb 2. Originally for 2nd Trumpet in C.
Klarinette in B 1 (transponierte Stimme) Arrangiert von Clyde D.
Klarinette in B 2 (transponierte Stimme) Arrangiert von Clyde D.
Trompete in B 1 (transponierte Stimme) Arrangiert von Clyde D.
Trompete in B 2 (transponierte Stimme) Arrangiert von Clyde D.